The Everstar wine cooler is made by well-known wine cooler brand Franklin for home superstar Home Depot. It is an attractive cooler in a perfect under-the-counter size. While many owners of this model swear by it, just as many seem to have a long list of complaints. Here is what you need to know if you are considering purchasing this controversial cooler. Glass doors offer a full view of the interior. Dual temperature and lighting controls for each side. Chrome plates wire racks are functional and attractive. Unit is designed to be used either as a free standing cooler or a built-in. Internal memory can hold information including temperature settings through power outages. Water leaks, both inside and outside the unit. Temperature alarm goes off regularly. Requires several inches of space above and behind if used as a built-in. Seems very prone to simply breaking and not cooling anymore. Owners who did not experience any of these problems adore their Everstar wine cooling units. However, the owners who had issues reported that customer service was either nonresponsive or slow in responding. This patchy track record should make a potential buyer seriously consider their purchase. Models of the Everstar wine cooler can run from $450 to $700, depending on the options and the style being purchased as well as current sales and promotions. 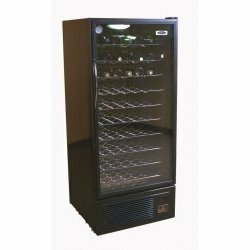 There are several different wine cooler brands that make models of this size in this price range. In fact, this range seems to be approximately average for this size and type of wine cooler. Popular brands Avanti and Haier both make similar wine coolers at about the same price. Because the Everstar is made specifically for Home Depot, it can only be bought there. However, buyers looking for this specific model should know that the Everstar is an exact copy of the Franklin Chef 36 Commercial Wine Cellar, which is available at Sears and other retailers for the same approximate price. It should be noted too, that the Franklin model in question has had the same complaints as the Everstar wine cooler. While the Everstar wine cellar may seem like a good deal with many popular and useful features, it may indeed be too good to be true. Few people have the patience for a wine cooler that, however multifunctional and attractive, leaves water stains on their floors and cannot keep wine at a stable temperature. Although every brand has its flaws, it is important to make an informed decision. Because there are many similar wine coolers available at the same stores for relatively the same price, shoppers should really spend the time to comparative shop, and determine clearly, whether or not this brand is the right one for them. We purchased a everstar 2 door wine cooler it worked for a about 1 year, if that, and it just stopped working. Its a problem trying to find a place to have it repaired. We went back to Home Depot where we purchased it and they had no info as to where to get it fixed, they gave us a non working number…So buyers beware of everstar products!!! We have an Everstar 28 bottle wine cooler, bought at Home Depot. Model# HDWC35. Do you know where we could get this serviced or where to get parts? The manual says it could be the Magnet Valve, because there is a temperature problem. Help! Have Everstar that stopped working after one year took back to Home Depot to no avail told me that they do not sell them any more very disappointed. So went to Lowes and bought a Fridedaire it runs well so far, meanwhile my Everster sits in my garage. Our Everstar wine celler only lasted about 2 yrs then quit cooling. Based on all the negative comments online I wouldn’t buy anything from Everstar again. DO NOT BUY ANYTHING THAT IS EVERSTAR RELATED! Temp fan goes on to cool it to 46 degrees then about an hour later starts to climb to over 70 degrees. unit 4 years old. Is it the thermostat? And where is it located. I think i have an 18 bottle Everstar wine cooler. Purchased 28 bottle cellar and worked fine until recently. Bought 5/31/09. Does not cool. Indicates compressor is running but temp says 72 degrees. Bought at Home Depot and number on book is not good. Sounds like I am just out of luck for getting repaired???? I have owned an Everstar wine cooler for 9 years and love it! it holds 100 bottles and cools them perfectly. Never any problems, very reliable, not to mention attractive. I purchased a 28 Bottle model #HDWC35 about four years ago. We were very happy with the cooler until it stopped cooling this week. Is there any hope that this unit could be repaired? We are located in Florida near Ft. Lauderdale. Please let me know if there is anyone in this area that would be able to repair this unit. looking for everstar wine cooler replacement shelves for counter height double door model. Does anyone have any? I have shelves if you still need them. Anyone know where to find replacement keys for an Everstar HDC100? I am mystified by these horrible reviews. And I’m the most critical reviewer on the the entire web! My model is the 15″ wide with 6 racks, purchased in 2010 or 2011 from Hm Depot. It works fine and cycles right according to the preset temp levels. The nice stainless steel/glass door look just as nice as the most expensive brands. My only grievance is the the sound level is probably too high for small homes where people in the den are located too near the kitchen and this refrigerator. I used mine for 6 without problem before remodeling my kitchen so that it was not required. I have a used Everstar HDC 100 for sale asking $105.00 or best offer. The unit it’s working fine and it’s located in Houston TX.